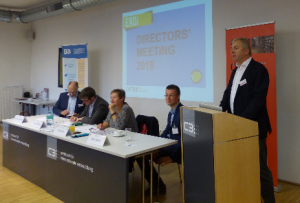 Dr. Maja Bučar, Professor, head of the Centre of International Relations, took part in the opening panel of the EADI (European Association of Development Research and Training Institutes) Directors’ Meeting on 11 and 12 October 2018 in Vienna, Austria. At the panel, focused on the European Development Policy, prof. Bučar critically summarised the main pillars of the European Consensus on Development – ‘Our world, our dignity, our future’ agreed by the European Commission in June 2017. The consensus, which aims to provide an effective development response and an implementation response to Agenda 2030, builds on a set of guiding principles and values for the development cooperation of the EU and its member states: democracy, rule of law, human rights, equality and solidarity, gender equality, rights-based approach and civil society. In view of this, prof. Bučar pointed to the obvious discrepancy between these values and discussions in the EU on migration issues, where “the language of this consensus seems to be forgotten”. After a critical discussion on the four main pillars from the consensus (i.e. people, planet, prosperity, and peace), she concluded her address by stressing that EU member states should be expected to align their roles with the consensus. However, the latter is predominantly used by the civil society as advocacy for ideas it wants its own governments to follow up on. You can read more about the discussions at the panel here.